Our Design Center Got an Upgrade. Check It Out! This fall, our garage door Design Center got an upgrade, and our customers have fallen in love with how easy it is to use, customize, and share their garage door design ideas.The new DoorView Visualizer makes quick work of figuring out which styles, materials, and hardware options look best with your home's existing aesthetic and curb appeal. Try it out here and see for yourself! Since your garage door can take up to 30% of your home's exterior, finding the right one is important. And it's sometimes stressful. The DoorView Visualizer takes the pressure off selecting the right garage door, and even makes it fun, especially because adding, removing, and changing options, materials, hardware, and colors just takes a few clicks of a button. Head here and click the DoorView design center link. Customize your door with the options available, choosing the right color, windows, glass, hardware, and appropriate door size. Use the available home images or upload your own, and then apply your door to the image to see how it looks. Save your design, print it out, or share it with the social media world and let them weigh in. Upgrading your garage door can be one of the best things homeowners can do in 2016 to improve the value of their home, according to Remodeling magazine's recent study on popular home renovation projects. 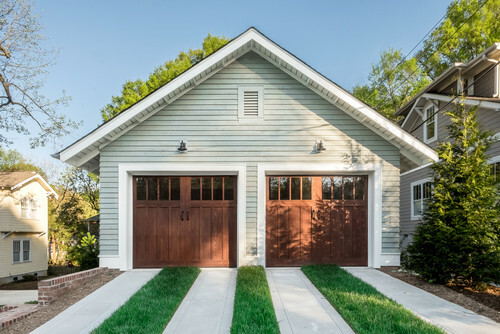 Whether you are thinking about selling or want your house to feel more like home, purchasing a new garage door is not only cost-effective, but also a great way to give the appearance of a large remodeling job in a single project. And you can get that freshly remodeled feeling as often as you want every time you design a new door with DoorView. Let's get started.